Gee, this is a post almost forgotten which should not be. For one, I had a blast at the event. Though I didn't know any of the people who were there, it was okay. 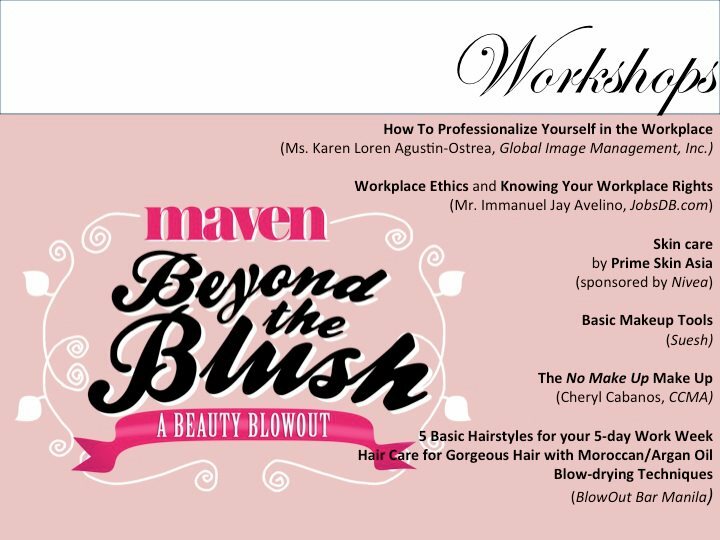 Last July 14, Maven Magazine readers gathered to learn and have fun. The June-July magazine issue of Maven where Angel Locsin wass billed, was the only ticket to join. Having one was well-worth it. Not only good reads from the issue, freebies and tons of stuff to learn about lifestyle and real living. Who would tell grabbing one would win me a bag of loots plus getting straight from the horse's mouth information about new trend in hair and make up, healthy living, and look-gorgeously with the stuff being sold in the exhibit and of course with discounts. Check the pictures to see the what's and the who's in the event. Also, let me thank Sweet Patti Cakes for sharing us some of her luscious cupcakes, it was really great having sips of champagne from Manny O Wines. The picture below summarizes what had transpired on that very fine day (though at the mid-part of the event, it rained so hard and had actually flooded the streets around Trinoma and SM North. Don't fret girls, this is just the first-leg of BEYOND THE BLUSH. Follow MAVEN at Facebook to check upcoming events and promos. Hi Eji! Yup, it was fun indeed. They will have more of this in the coming months, let's watch out for it! Would love another round! Looks like a lot of fun and awesome loot! The loot was indeed great! I shared it to my niece and daughter. Hope you could also join the upcoming events. Wow! Wella what a compliment! You are always welcome to drop by!